San Diego State University announced today the largest single gift it has ever received — $20 million from developer and philanthropist Conrad Prebys. 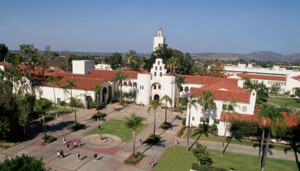 The money will endow scholarships that will benefit around 150 students annually, according to SDSU. In exchange, the new student union building that opened last month will be called the Conrad Prebys Aztec Student Union. — high-achieving students involved in a program of rigorous study emphasizing creativity, leadership and critical thinking. Prebys is a longtime financial supporter of San Diego institutions, including KPBS, UC San Diego, the San Diego Zoo, Boys and Girls Club, Old Globe Theater, La Jolla Music Society, San Diego Opera, Scripps Mercy Hospital, Scripps Prebys Cardiovascular Center, Sanford-Burnham Medical Research Institute and the Salk Institute. The gift pushes the total for the multi-year Campaign for SDSU to $465 million. The fundraising campaign has a goal of $500 million. You could tag this as philanthropy or charity as well as education.